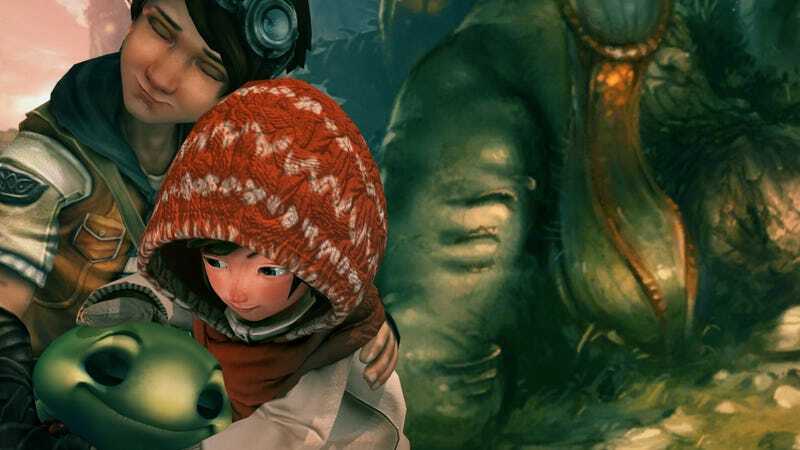 Silence, the long-awaited sequel to Daedalic Entertainment’s The Whispered World, begins with a World War II bombing raid that sends 16 year old Noah and his little sister into the magical world that exists between life and death. It’s a sad way to begin a beautiful adventure. Originally published 11/15/2016. Repubbed to mark this week’s release of the Xbox One version. Originally announced in late 2013 for a 2014 release, Silence arrives today on PlayStation 4 and PC, with an Xbox Anywhere version arriving on Friday. Its predecessor, The Whispered World, is an award-winning adventure game released in 2009 that was praised for its hand-painted visuals and story but criticized for sub-par voice work and often convoluted puzzles. Inside the bunker, Noah calms Renie by acting out the events of The Whispered World, a clever way to recap. Silence is still hit-or-miss with the voice work (Noah’s sister Renie tries real hard), but the hand-painted visuals have been paired with gorgeous 3D characters to excellent effect, and the puzzles have been streamlined, doing away with the old school inventory system of its predecessor in favor of a more intuitive mechanic where important items are always at hand. Following the bombing, Noah and Renie find themselves in the world of Silence, a place that’s as serene and stunning as it is perilous. Dark creatures terrorize the world’s remaining cities, challenged by a handful of desperate rebels. The pair are initially separated, Noah finding himself in the company of a rebel girl named Kyra, while Renie is escorted to the rebel’s camp by Samuel, a massive rebel with a heart just as large. The clip below should give prospective players a good idea of how the game presents and solves puzzles. I’ve been playing Silence for several hours now, and the game really gets me. It’s the story of the love between and brother and sister seeking their way out of a mirror world that could mean the worst for both of them. My younger sister, Nadine, once threw a hand mirror at me. It’s like they know me. A point and click adventure at heart, even though it’s much less “click the thing on your inventory on everything else until something happens” than its predecessor, Silence might not be for everybody. The pace is slow and thoughtful. You don’t have to have played The Whispered World to enjoy the story, but you’ll certainly get more out of it if you did. I’m enjoying my time in the world of Silence quite a bit, and can’t wait to see where the story takes me. Maybe I should call my little sister. At least something nicer than what I usually call her. Silence is available today on PlayStation 4 and PC via GoG and Steam. A demo is available on PC. The Xbox Anywhere version arrives on November 18 December 9.